A three hour drive northwest of New York City, in the Empire State’s Southern Tier region, is the small community of Endicott. Nestled along the Susquehanna River, it is known as the “Birthplace of IBM.” International Business Machines Corporation (IBM)—born of a marriage between the Computing, Tabulating, and Recording Company and the International Time Recording Company—opened its first plant in Endicott in 1924. From the 1920s to the 1970s, the IBM-Endicott facility figured centrally in electronic innovations, and the surrounding community enjoyed relative prosperity. Since the 1980s, however, the area has experienced steady decline due to IBM’s disinvestment in the Endicott facility and the outsourcing of manufacturing jobs. It was then that I first learned about how, despite the plant’s closure, the specters of its business and technological innovations continued to haunt Endicott in the form of social, environmental, and health consequences. When IBM sold its Endicott facility in 2002, the town was left with a collapsed tax base and a distressed workforce. My ethnographic research there began in 2002 as the sale of the IBM-Endicott plant was underway.It was then that I first learned about how, despite the plant’s closure, the specters of its business and technological innovations continued to haunt Endicott in the form of social, environmental, and health consequences. For example, with the IBM exodus, residents saw a crippling decline in local property values, the loss of jobs, and enduring environmental contamination problems that continue to be the target of many local public health concerns. 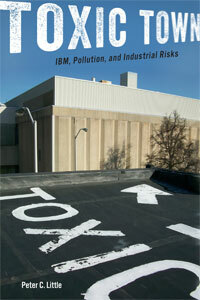 This whirlpool of issues and tangled struggles sparked my genuine interest in the lives of ordinary people navigating a tainted, post-IBM economy and toxic ecology, and is the primary focus of my book Toxic Town: IBM, Pollution, and Industrial Risks (2014, New York University Press). Today, Endicott is the site of a contentious U.S. EPA Superfund site—a high-priority hazardous waste site—consisting of a 300-acre toxic plume of trichloroethylene (or TCE).This cancer-causing chlorine-based cleaning solvent was heavily used by IBM to manufacture chip boards and other microelectronics at the former Endicott plant. Many feel that restoring life in Endicott to what it was before the IBM spills is a questionable long-shot goal. At Superfund sites with a clearly defined “responsible party,” capital-rich companies like IBM can use their abundant legal and monetary resources to indefinitely prolong a lawsuit, leaving the community of plaintiffs exhausted and worn down in their struggle for justice. TCE, a groundwater contaminant found at over 70 percent of Superfund sites nationwide, raises numerous environmental health concerns. A recent epidemiological study in Endicott strongly suggests that TCE exposures are associated with cardiac effects, low birth weight, and fetal growth restriction. A large-scale remediation and mitigation effort started in the late 1970s when chemical spills from the then-active IBM plant began. Nevertheless, many residents continue to doubt the efficacy of risk-management decisions taken by public-health authorities, contending that, as one resident put it, “no matter what IBM or the state agencies do, we have to live with it, and that is the problem they can’t fix.” Adding to this toxic struggle is a prolonged class-action lawsuit, made up of over 1,000 plaintiffs. Most plaintiffs I have spoken to add this lawsuit to their list of headaches, and nobody I have interviewed over the years feels the lawsuit will ever result in any meaningful compensation.Many feel that restoring life in Endicott to what it was before the IBM spills is a questionable long-shot goal. 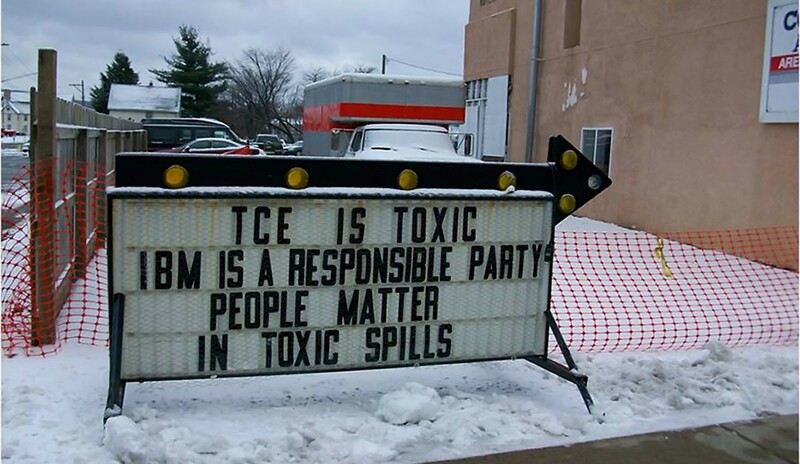 At Superfund sites with a clearly defined “responsible party,” capital-rich companies like IBM can use their abundant legal and monetary resources to indefinitely prolong a lawsuit, leaving the community of plaintiffs exhausted and worn down in their struggle for justice. IBM’s ambitious Smarter Planet initiative promises digital technology solutions that modernize the infrastructure of nation-states and build “Smarter Cities” by installing energy-efficient (or “smart grid”) infrastructure and reducing traffic congestion via sensor technology. It’s no secret that IBM is becoming more entangled in city- and nation-building efforts. Its commitment to expanding techno-modernization—and its deep ties to government and industry here and abroad —date back to the company’s founding in the early 1910s. Today IBM is going beyond city and nation-building projects with its Smarter Planet initiative, offering to perform the audacious, but not impossible, act of corralling investors to embark on rebuilding Planet Earth itself. These observations bring to light the marked contrast between the world where IBM manufactures its products, and the world IBM says it is creating through them. One might consider IBM’s Smarter Planet mission just another marketing strategy on the high-tech corporate playing field. Yet here lies IBM’s greatest contradiction: while IBM purports to be building a smarter, more modern, more urban and more sustainable world, it is actually leaving behind a trail of exploitation, economic marginalization and environmental degradation in out-of-the-way places like Endicott. But for me, a former resident of Endicott and an ethnographer who has spent time listening to the struggles of people living in IBM’s tainted birthplace, this corporate planetary responsibility campaign reflects a paradoxical ethos of caring and exploitation. It aspires to what philosopher Peter Sloterdijk, in his multi-volume Spheres, terms “thoroughgoing market enlightenment that promises a better life.” But the campaign’s logic, as always, is one of profit maximization, not global advancements in social and environmental justice. Each time I come across another ad showcasing IBM’s mammoth technological effort to “Build a Smarter Planet,” I am reminded that our neoliberal techno-capitalist world is also a world of microelectronic disaster that leaves me wondering: What Smarter Planet? Whose Smarter Planet? What is “smart” about what is unfolding in IBM’s birthplace? Perhaps focusing on the entire “planet” allows IBM to sidestep the vibrant particulars of deindustrialization and corporate environmental plunder, a way to shift the focus to an ever greater, but ultimately opaque, sphere of innovation, transformation, and profit. Instead of being hypnotized by this planetary vision, we might look to Endicott for lessons about the toxic legacies and costs of “smarter,” high-tech neoliberalization and the supposed intelligence underlying contemporary corporate responsibility practices. Such a move, I argue in Toxic Town, calls for an ever “smarter” and critical approach to industrial pollution and toxics risk.